James Lohan and Tamara Heber-Percy are two of The Luxury Travel Bible's favourite people, they know 'Boutique' like no one else. We can't help but trust a couple who were inspired to set up a company on the basis of looking for their own perfect 'dirty weekend' away. From such romantic beginnings has grown a booking agency with a difference specializing in the boutique and the unique - we've never checked into a Mr and Mrs Smith hotel we didn't like and here at TLTB we're pretty fussy. The company now has a headquarters in London, with offices in Melbourne (headed by the debonair Simon Westcott) and New York and a portfolio of 850 properties on its books. But which are James and Tamara's all-time favourites? We ask then to spill the boutique beans. We love the name of your company with all those 'dirty weekend' connotations. Tell us how you came to chose it. James - It's an irreverent reference to naughty weekends away. In the UK it's a saucy British tradition to register at a hotel as 'Mr & Mrs Smith' when you're on an anonymous, romantic escape. As we are all about couples travelling together, we thought the name was perfect and had a sense of humour that suited the brand. James, You had a successful restaurant business and exclusive members' club (The White House) as well as organising some legendary parties and events. What inspired you to get involved in the hotel industry? James - It was completely by chance. I came into the travel industry essentially as a consumer identifying a gap in the market. I suppose my experience in managing events and creating experiences extended to knowing what people like me wanted out of their travel. Early on in our relationship, I was trying to impress Tamara by organising a romantic weekend away. We ended up in a supposedly luxurious hotel, but when we got there, the room was nothing like the one in the guide we'd used, the service was fussy and formal, they wouldn't feed us after 9pm and there was a very unstylish Corby trouser press and Teasmade complete with ginger biscuits on a doily in the room. It was a disaster. We realised there and then that there wasn't a guide we trusted to give us advice on the most beautiful and stylish places to stay. At the time, small boutique hotels were starting to open in the UK, with Babington House being one of the first, so we tapped into this new hotel trend that was just taking off. We were determined to find the best and most unique hotels and to create our own ground-breaking guidebook. Tamara, how did you move from running a dating agency to falling in love with hotels? Tamara - I was with James on that notorious 'bad weekend away', so we came up with the idea together. We were both busy people, running our own companies and we loved escaping for the weekends to inspiring places. That time away was really valuable. We didn't want to waste it or get anything wrong, and we knew a lot of friends who felt the same, who had moved on from going to bars and clubs in their downtime to the more grown-up experience of staying in chic hotels. You now have more than 850 properties on your books. What is the single best/defining thing about hotels and private houses that are chosen to join the Mr & Mrs Smith stable? James - Wow factor and thoughtful personal touches. Tamara - When style meets comfort and marries service effortlessly. James - A hotel in our collection not only has to have an unmatched ambience and hit the right style notes, it has to tick our 'certain something' box: the welcome should be warm, without fuss or formality; rooms should be seductive and supplied with thoughtful extras; drinks must be perfectly mixed and dinners delicious; and, crucially, the stay must be memorable for all the right reasons. Tamara - Lots of people ask us what we look for in the perfect Smith hotel, especially when it seems like everyone is jumping on the boutique bandwagon. Style with substance; comfort; and something that makes it stand out from the crowd. Passionate owners or general managers also play a fundamental role in creating a great place to stay. We ask ourselves lots of questions: is the guest experience worth the asking price? Is the bed incredibly comfortable with beautiful quality linens? Can you control the lighting? Could you stay in the whole weekend and still have a great time? Would you want to go back? Would you recommend it to a friend? James - Over the years, we've seen an array of services and facilities emerging at the luxury end, from pillow menus and personal butlers to tailor-made room scenting and poolside staff exclusively to clean your sunglasses. Hotels are always looking for the next unique service angle to distinguish them from their competitors. Now we see that technology is playing a huge part in the hotel experience, with preloaded iPods providing the soundtrack to your trip away, iPad-based wine lists to help you find out about vineyards or producers and the creation of localised mobile apps to share highly targeted destination information and travel tips with guests. Tamara - There is a definitive move in luxury, away from 'bling' and towards a less ostentatious luxury style and hotels are becoming genuine with their eco-policies, such as using sustainable produce, developing kitchen gardens, (now even livestock), and giving something back to communities. Hotels are increasingly wearing their green credentials on their sleeves. These days, it's not about just asking the guests whether they want their towels laundered every day - more cost-saving than planet-saving - but even inner-city properties are turning to rainwater harvesting, recycling and the use of environmentally friendly products. Minibars and bathrooms are getting a makeover, too, as hotels turn to locally made, organic options for food, drinks and toiletries. The latest addition to the Dorchester Collection - Coworth Park, a 17th-century mansion and polo estate just outside London - has had an amazing eco-friendly makeover and has a 15-mile 'field to fork' policy. James - I loved The Upper House in Hong Kong, where the attention to detail is incredible and the views of the city amazing. 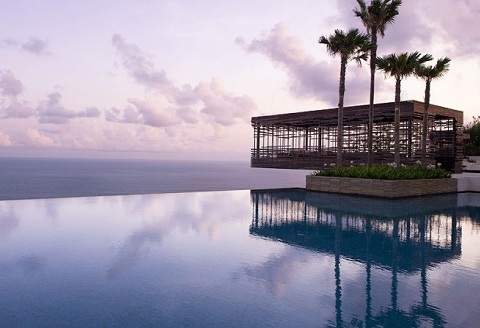 For a more relaxing break, Alila Uluwatu in Bali is a dramatic eco-friendly spa retreat in a jaw-dropping setting - the Indian Ocean views are fantastic. 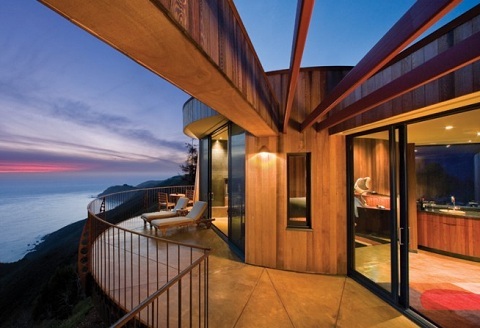 Tamara - My (current) favourite hotel in our collection is probably the Post Ranch Inn in Big Sur, California, which has secluded, cliff-edge rooms fashioned in repurposed redwood. The views are simply breathtaking (but not for vertigo sufferers). 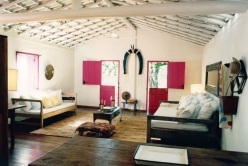 However, my country of choice for me at the moment has to be Brazil where I could happily live at Uxua Casa Hotel in Bahia - the owner used to be the creative director of Diesel and he has got the mix of laid-back and luxurious exactly right. Pick some large hotels which don't fit the 'boutique' Mr and Mrs Smith bill that you nevertheless like to stay in. James - It's difficult for a large hotel to create a boutique experience but there are some that do pull it off. Usually, we stick to hotels with roughly 50 rooms or less, but our collection has everything from two-room renovated inns to luxurious city hotels, so it is quite varied. 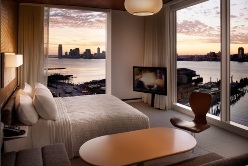 The larger properties in our collection include The Standard NY in Manhattan which has more than 300 rooms, but the decor and vibe give it a sleek sense of intimacy. The Fullerton Bay Hotel in Singapore has just under 100 rooms but delivers a very personal service and we love the intimate Jacuzzi pools on the roof. Tamara - We've just invited the recently renovated Savoy Hotel in London to join our Vintage collection (our tag for hotels with classic looks rather than contemporary style). This caused much debate as the hotel has a particularly traditional reputation and history, and, with more than 280 rooms, it's really quite big. However, it is iconic and unique. In the end, the experience of staying there and the superb service made us feel that we would genuinely recommend it to a good friend wanting a fabulous old-school stay, and that our fans would really enjoy staying there. There have been rumours (on and off) that you would one day open your own hotel. Do you still want to do this? James - We're still looking for the right location! Tamara - Watch this space. James - Lobster and chips with your feet in the sand at Juan y Andrea in Formentera, Ibiza's neighbouring island. Tamara - I love cucina povera - down-to-earth Italian food - and the best experience I've had recently was La Tagliata, a family-run, hilltop restaurant near Positano that serves expertly barbecued farm-style fare in very simple surroundings. The atmosphere is busy and welcoming, the portions are huge, the red wine is fabulous and the views are unbelievable. James - Singapore Airlines have the best business class in their A380 air buses. Tamara - I recently flew back from Hong Kong on British Airways and love the Elemis range of products. James - A hammam for two at the luxurious Ksar Char Bagh in Marrakech bordered on life-changing. Tamara - We went to Royal Malewane in South Africa on our honeymoon, and the whole stay was unforgettable - from the elephants draining our private swimming pool to the romantic sundowners looking out across the plains. James - Fast-track through the airport when you book first class, and a flat bed on a long haul flight. Tamara - First Luggage, which collects and your luggage delivers it to your hotel room. James - A cure for jet lag. Tamara - True emotion. Now we have children, I love seeing their faces when they see or experience something new while travelling. I'm reliving the excitement and discovery of travel through them.